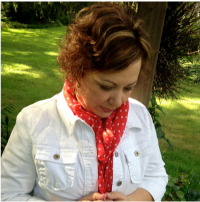 Welcome to Hymns & Verses! If you are visiting from The House of Silver Lining, I’m so glad you’re here today to see my home all dressed up for summertime! Let’s start my 2016 summer home tour in the living room. 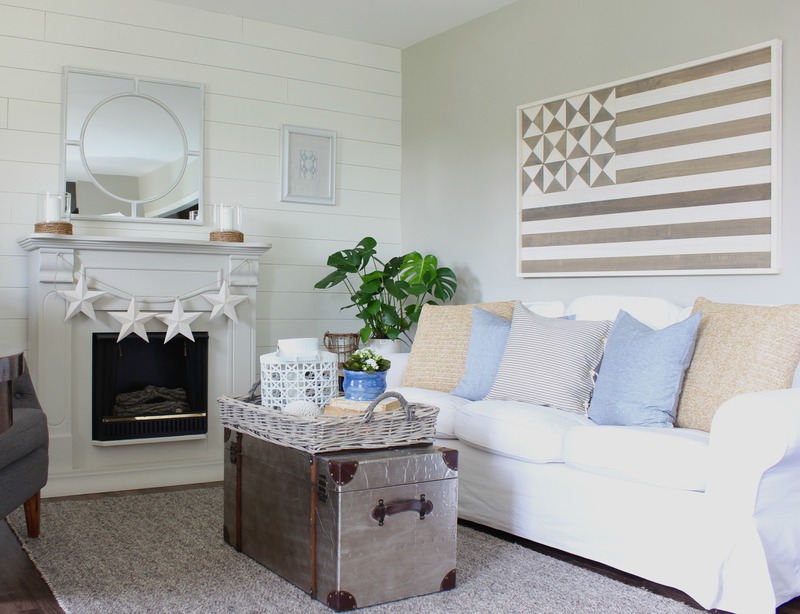 My summer living room features a DIY knock-off of Pottery Barn’s Hermosa Planked Flag Wall Art. The moment I laid eyes on this quilt style flag sign in the Pottery Barn catalog, I was in loooooove! I showed it to Mark and asked if he thought we could make this for less – the Pottery Barn original price was $299 (it’s currently on sale for $179). We used the dimensions of the PB original and ours came in around $50. I love how it turned out!! I strayed from the colors I tend to gravitate toward, and brought in some chambray blue. I have to say, why has it taken me so long to like blue! The blue pottery piece below was made by one of my boys in a high school pottery class – (when I was in school, we didn’t have pottery class! We had wood shop and home economics!). Not fair! I’m so glad I held on to all those pots of many colors the boys brought home – this blue one was just the “POP” of color I was looking for. Those wooden stars have been in my attic for about three years. I got them at an amazing after Christmas sale at Michael’s, but didn’t have a clue what I would use them for. I gave them a simple white wash and used them to make a fun garland and also used them on the shelf above the library table. The Americana elements made me feel a little nostalgic, so I brought out my vintage Underwood. 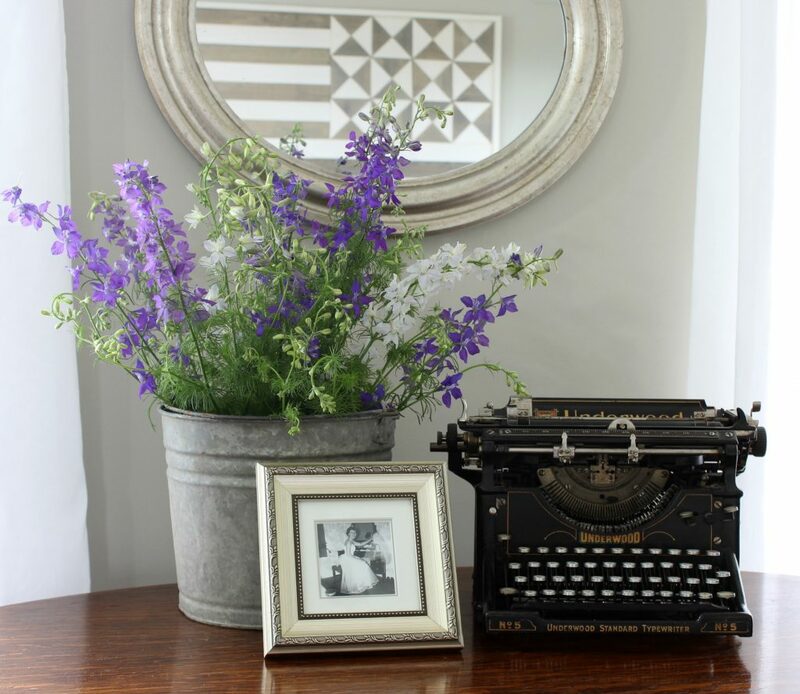 I paired it with an old tin bucket and filled it with larkspur from my garden. The vintage vignette was completed with a picture of my Mom on her wedding day. The white linen pillows were made from pretty napkins I found on clearance. A pack of four 20″ napkins make the perfect pair of pillows! Our little entryway got a bit of an update. Nothing earth shattering, but a simple coat rack and a bench that Mark made for me. I made the sign – it’s one of my favorite lyrics and is perfect to see as you head out the door! I’ve been adding more plants indoors. 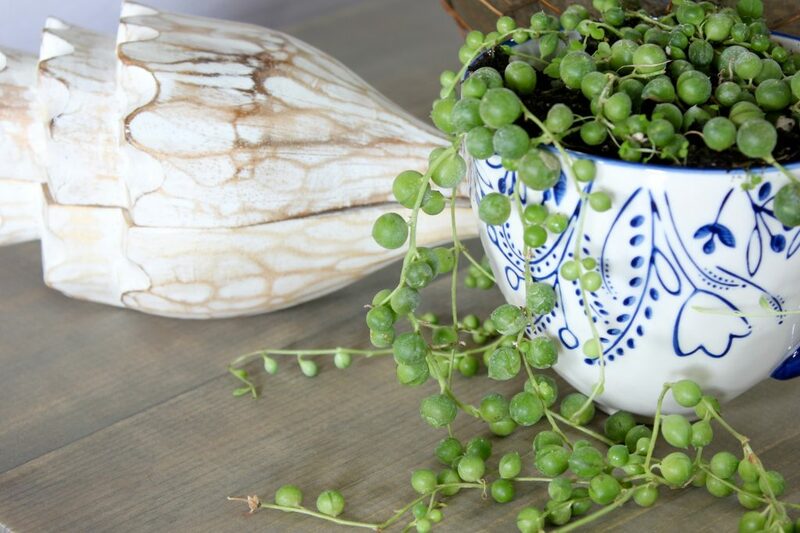 I picked up this small “String of Pearls” plant, but for the life of me, couldn’t find a planter that I liked that was small enough for it’s petite size. So, I ended up planting it in this pretty mug. Now let’s head into the dining room. 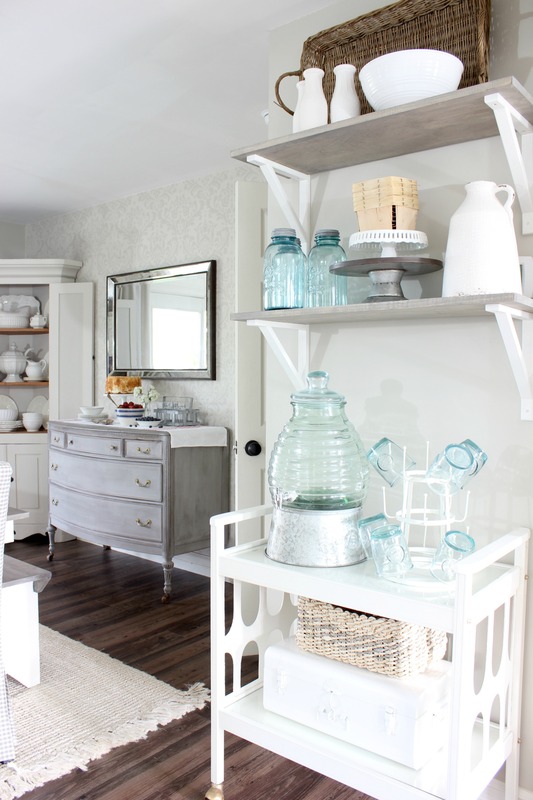 We added some shelves above the bar cart to give me some extra storage – and for display (of course). 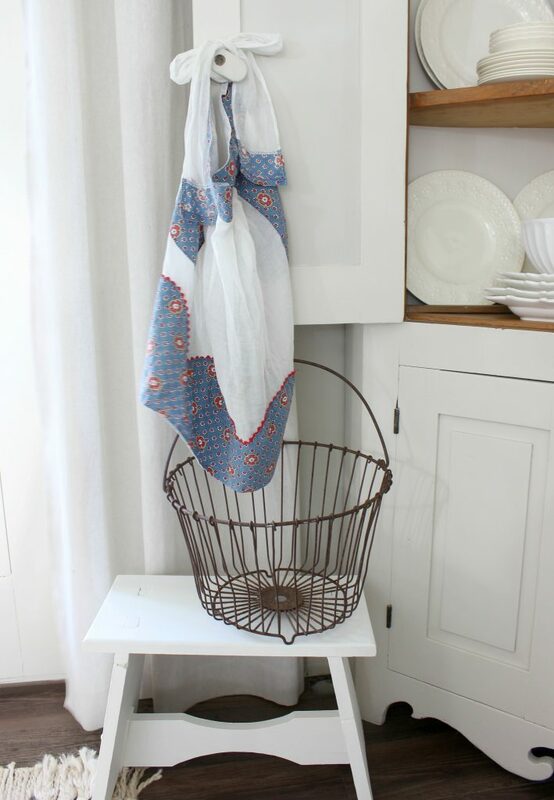 My favorite thing on the shelves – those vintage wooden berry baskets I found recently at an antique shop! Speaking of berries, we’re into full summer strawberry season here in Pennsylvania! 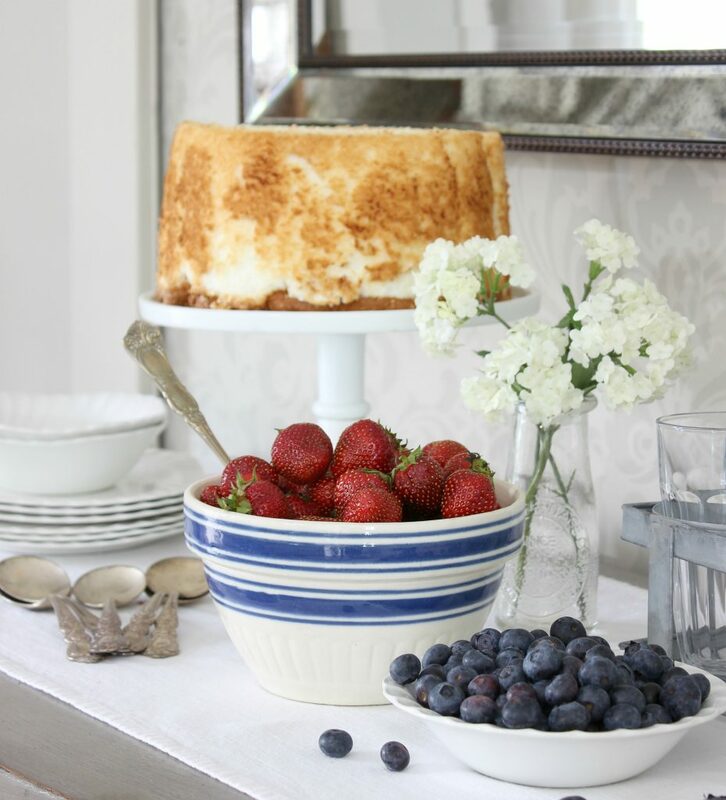 One of our favorite summertime treats is a simple angel food cake with fresh strawberries – Yum!!! What do you do when your peony centerpiece falls apart – literally – before your photoshoot? Head out for a drive with your garden sheers and fill your trunk with some Queen Anne’s Lace from along the side of the road! I picked up this pretty tray at Target earlier this spring and used it to hold my vase of flowers. I tucked some starfish, shells, and the vintage green glass bottles I found at a barn sale around the base. Here’s a look at my corner cupboard. 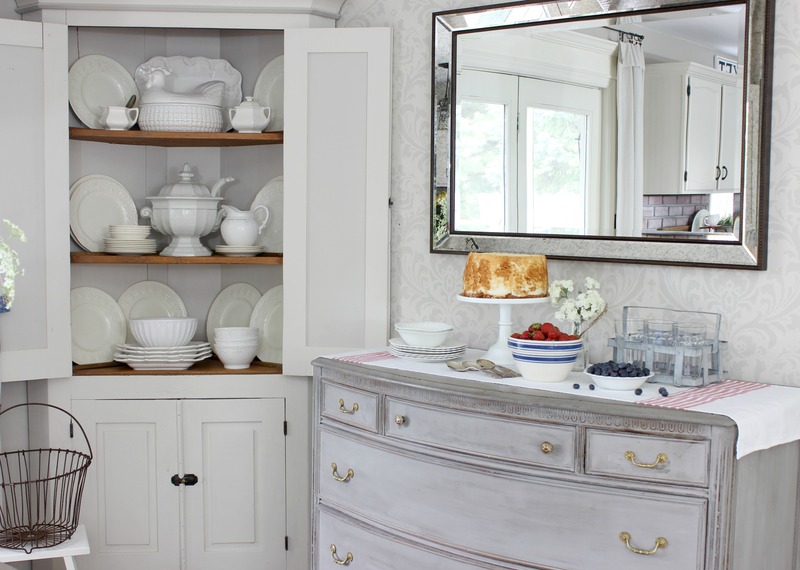 I kept it pretty simple with mostly vintage white dishes. I couldn’t resist this little vintage apron! 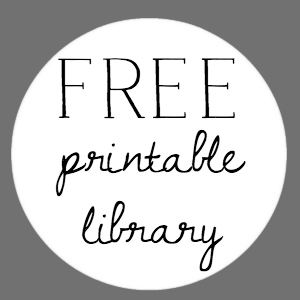 It’s so delicate – and that print!!!! 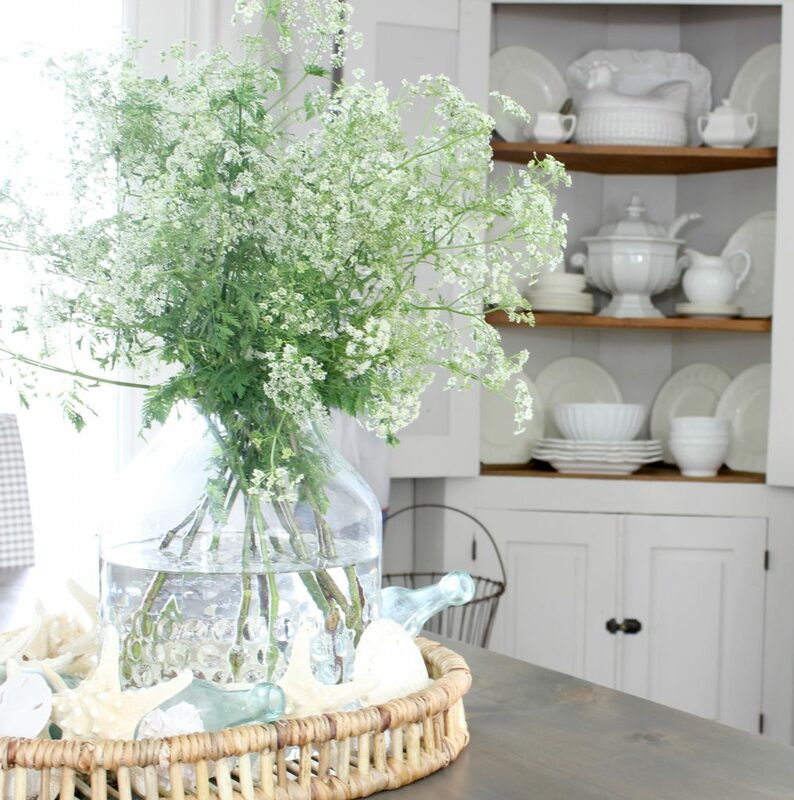 I brought in a few red and white items to accessorize the kitchen. In fact, I almost always have a bit of red in my mainly neutral kitchen. The bright white and crisp red really brights up the space. I’m saving my screen porch and bedroom for a later date! 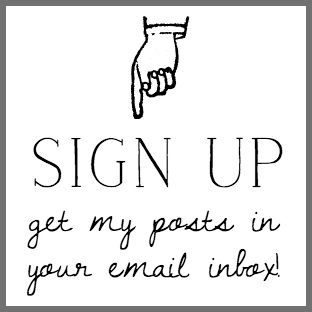 Be sure to follow me by email so you don’t miss them! 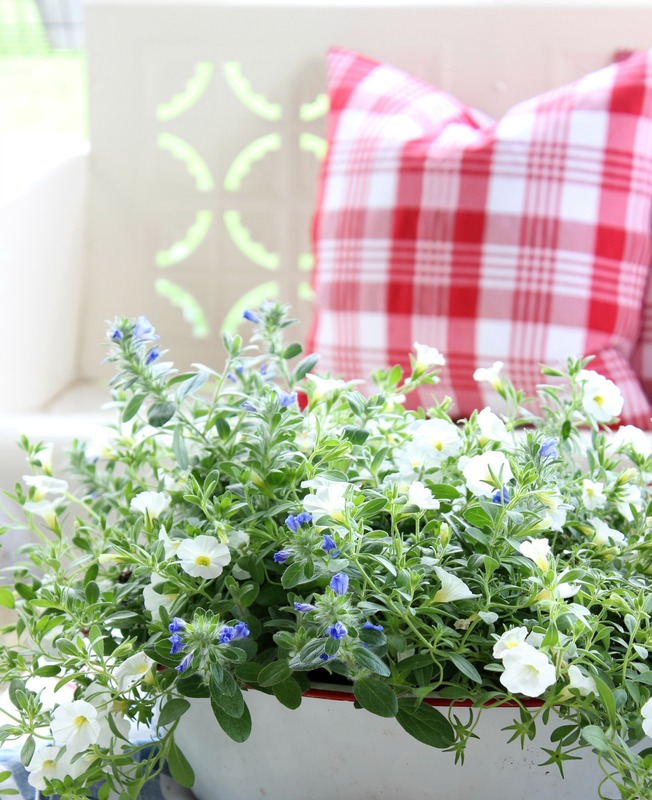 My summer screen porch is one of my favorite spaces to decorate and I can’t wait for you to see it! Here’s just a sneak peek! Thanks for stopping by and taking my summer tour! Here’s the line up for tomorrow’s tours! You’ll be starting at Jennifer’s home- Dimples & Tangles! Simply amazing!!! You’ve evolved into one of the top designers!! I’m amazed how creative you’ve been with your decor season to season. Loved it all!! Thanks so much for the sweet comment, Gwen. So glad you liked the tour! Have a wonderful summer!!! Thanks so much, Stacey!!! Have a wonderful summer!!! Thanks so much, Julia! Have a great summer! What a perfect summertime tour! 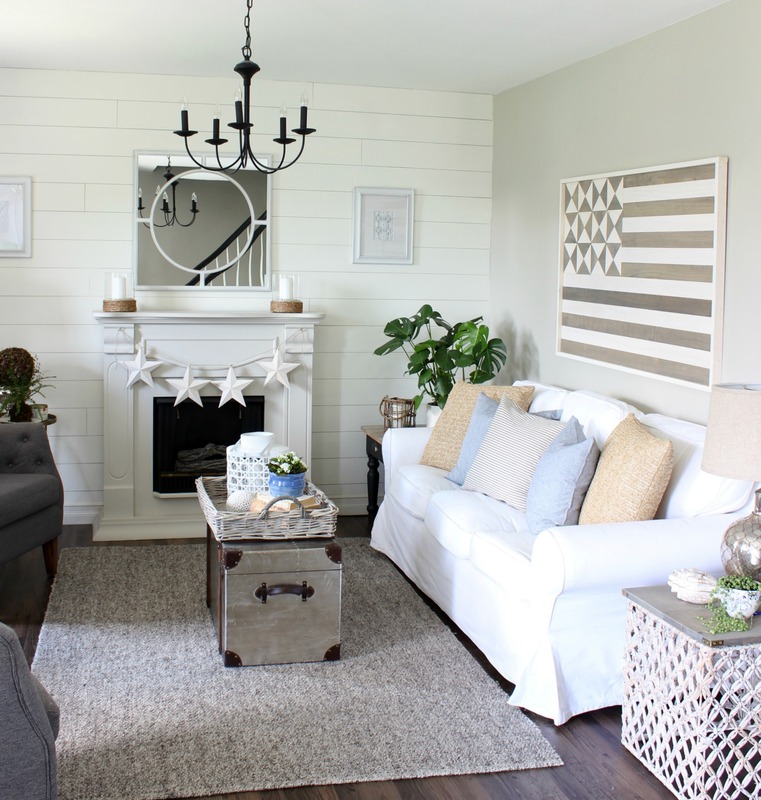 I adore your wooden flag wall art. I love the red and blue accents. 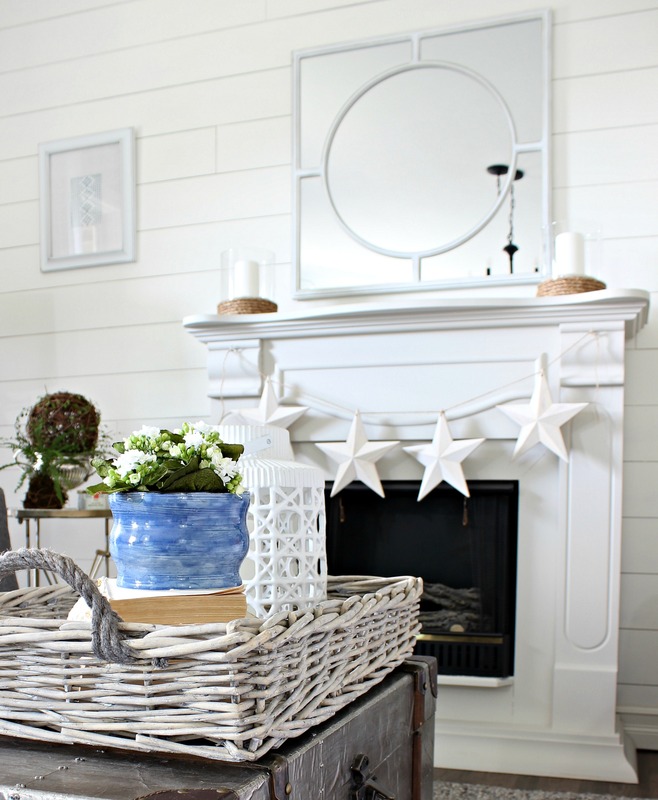 Those stars, the perfect Americana addition! Your home is beautiful and so ready for Summer! I really enjoyed your tour. Everything looks so pretty and fresh. I am looking forward to your screened porch. It is always one of my favorites! That flag art is amazing, I love it, what a great job your hubby did. I also love the touches of blue you are adding in. Your home is always so lovely and so inviting. Thanks for joining the 2016 Summer Home Tours. I agree! Amazing and lovely!!!! Thanks so much, Marci! Hope you have a wonderful summer! Thanks, Marty! 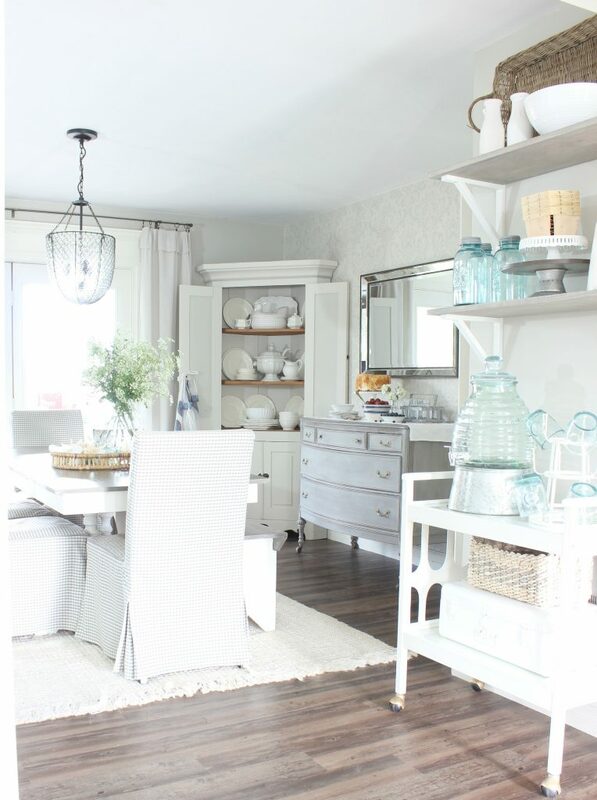 I loved it in the catalog and so glad we were able to recreate the look for less!!! Thanks for all you did to make these tours happen!!! Your home looks amazing! I poured over each picture enjoying every detail. Your flag art is definitely my favorite thing. Thanks so much, Paula. That flag art is my favorite thing – maybe of all time – that we’ve made. It’s staying up all through summer for sure!!! Thanks so very much, Rebeca! I wish I lived closer to the beach, but at least it’s nice to bring that coastal style in each summer season!!! Thanks so much, dear friend! I can’t wait to see your tour! I loved seeing your video tour on FB – I’ve gotta do that!!! Thanks so much, Kristin! That means a ton coming from you!!! Have a wonderful summer!!! Enjoyed the tour, Doreen and that flag knockoff is amazing!! Thanks so much, Kim! I loved that flag the moment I saw it in the catalog and knew it would be a good knock off. But, have to say it came out way better than I even expected – and was pretty easy (when you have a husband with power tools, that is!!!) Have a great summer!!! 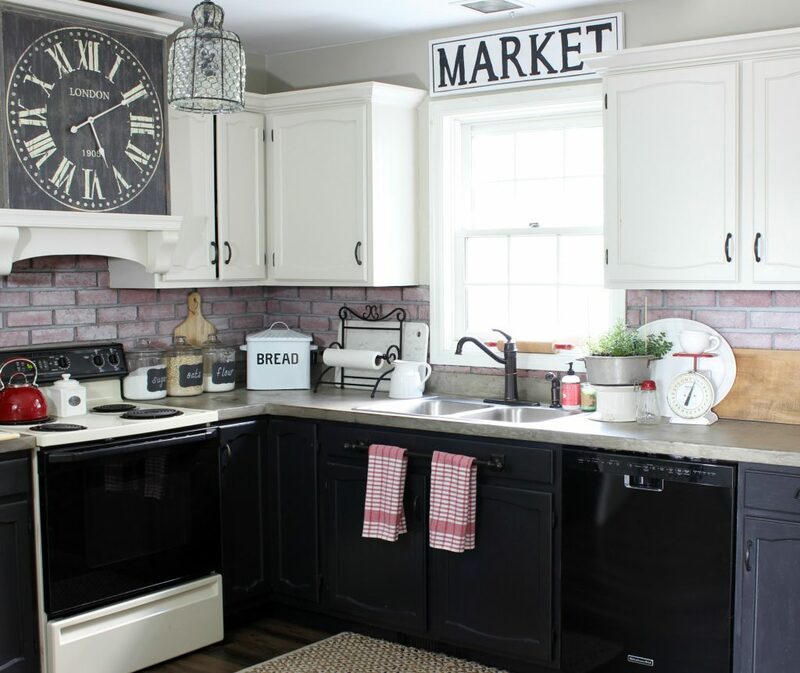 Love the red in your kitchen. Looking forward to your porch.Beautiful pictures. Thanks for sharing. Hi, Renee. Thanks for your sweet comment! The porch will be finished soon and I’ll hopefully have the post up on Friday!!! Thanks so much, Rhonda. I love that flag too – it’s one of my favorite things we’ve every made!!! I’ll be posting a tutorial for it soon!!! Doreen, I so enjoyed your tour today! From the flag artwork to the handmade blue piece of pottery, I enjoyed it all. 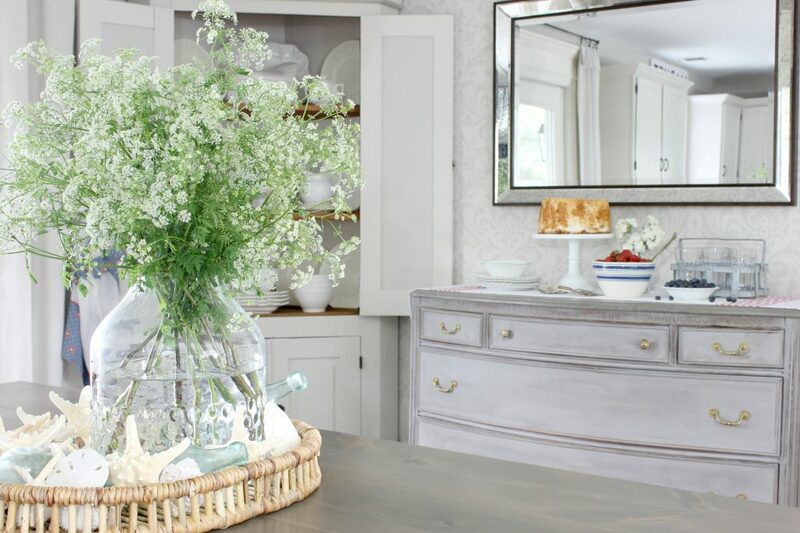 I just love your style, and I think the Queen Anne’s lace bouquet was a better choice of flowers. Looking forward to seeing your porch all decorated for summer! Thanks so much, Jane!!! Isn’t Queen Anne’s Lace wonderful!!! I loved it when I was little – we would mix food coloring in the water and it would turn the flowers to a pastel color! I am putting the finishing touches on the porch and hope to have the post up on Friday!!! Gotta get it done so I can enjoy it this summer!!! Just lovely! 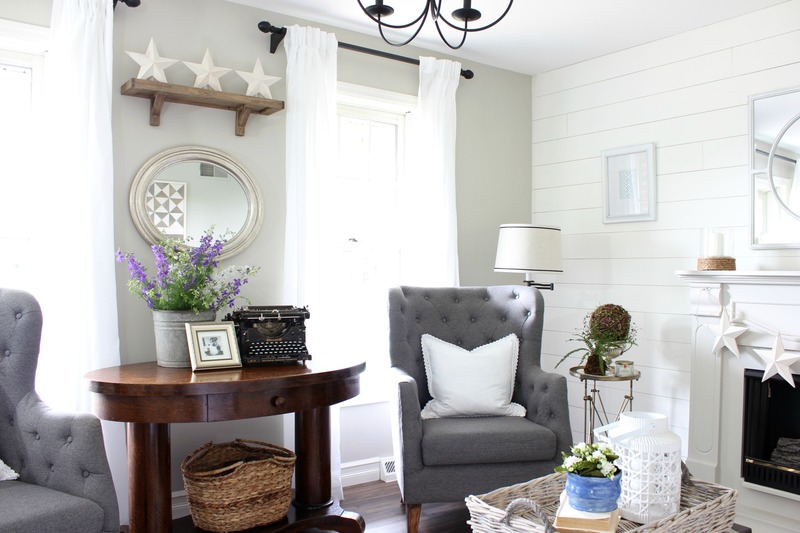 Very homey and comforting, and looks so relaxing. I could move right in! Thanks so much, Barbara! Have a wonderful summer!!! Love how you incorporated your son’s pottery piece! Priceless and cherished! Love the tour! Thanks, Shauna! I have several pottery pieces from the boys that I treasure! what a gorgeous home. 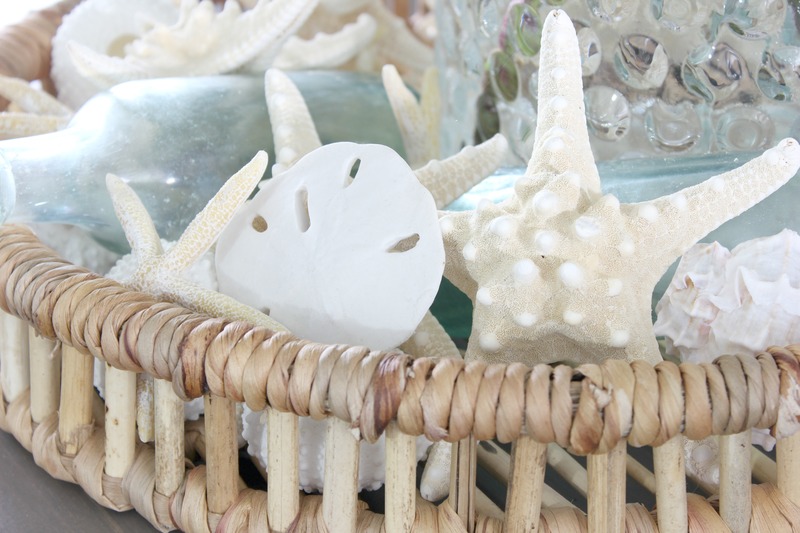 your home is bright, fresh and ready for the summer season. Thanks, Laura. Have a great summer with your family and enjoy all of those amazing outdoor spaces you and your hubs have created!!! P.S. I always love seeing your tire swing – I had a tire swing growing up on the farm and seeing it always takes me back!!! What a cozy and inviting home! Lovely! sooooo pretty, doreen! love the huge stars and i love your queen anne’s lace! i do the same thing- grab it from the side of the road! no shame in my game! So much to love Doreen! 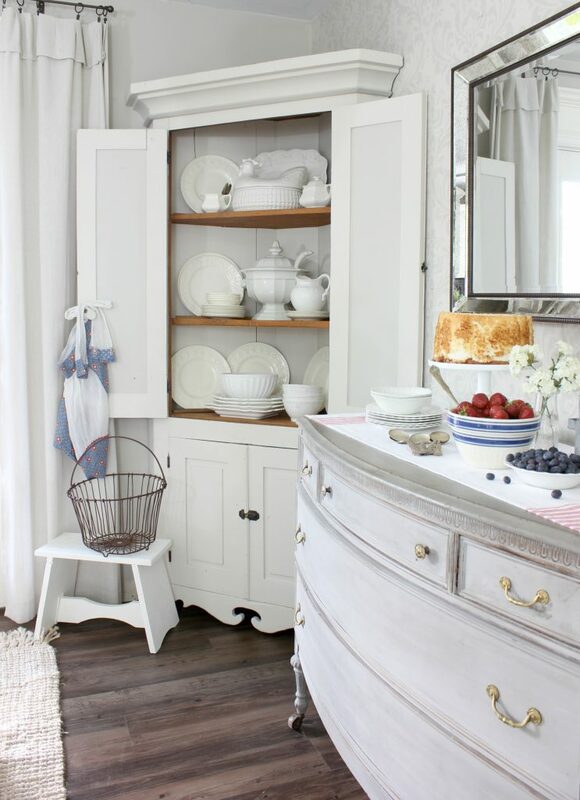 You have such a charming and inviting style! Living beautifully here… Love the tour and so peacefully inspiring. Two questions! 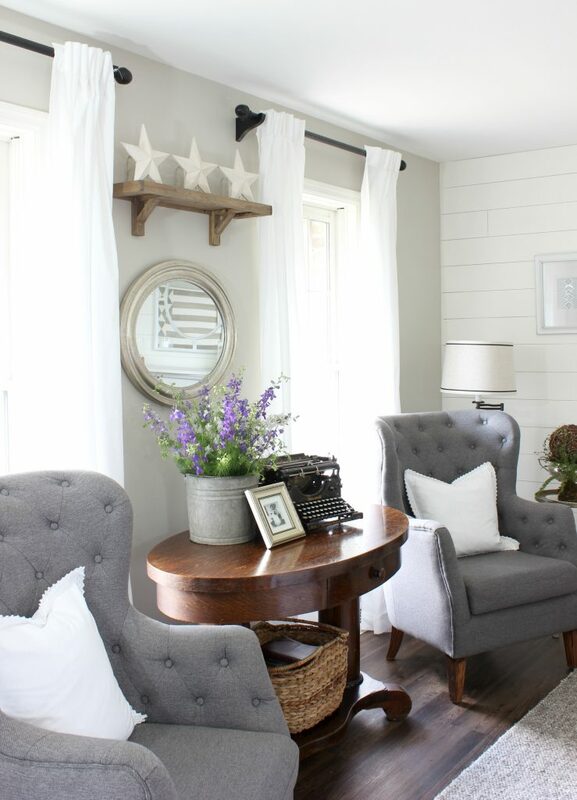 Where did your gray arm chairs come from and what are they called? Also where did your light fixture over your dining table come from and what’s its name?! I love!!! 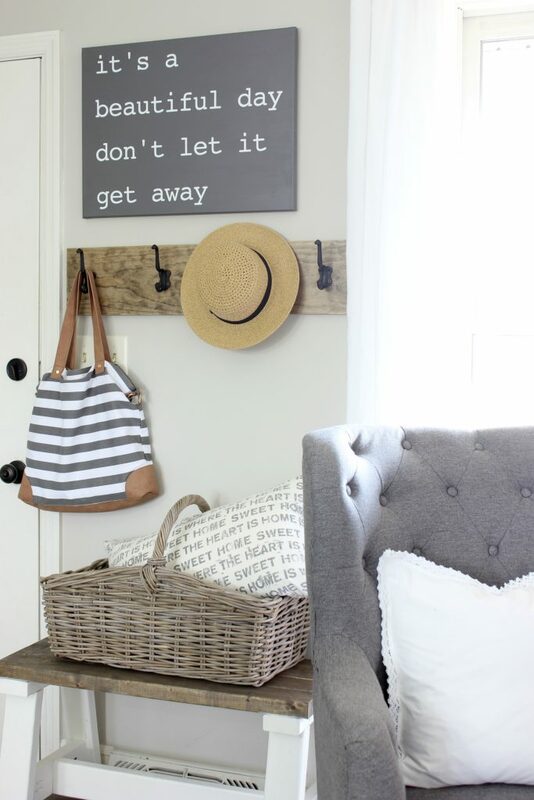 Down the coat rack in your entryway??? Hi, Mallory We made it. It’s just a simple board with hooks attached.